In a hurricane, a house becomes a pressure cooker if its outer envelope is pierced by high winds and wind-driven debris. When windows fail, high winds enter the house and can blow out an opposing wall or tear the roof off completely, leaving the home exposed to wind and water. Bob Vila, building expert. Protecting the window openings of a house is probably one of the most important steps a person can take to protect their family and belongings. When a hurricane hits, high winds and pounding rains are the result. High winds can cause objects such as roof tiles, branches, garbage cans and so on to become projectiles. When this happens, the outer envelope – the separation between the interior and the exterior environments of a building is at risk. As noted in the quote above, windows are key points of entry. If a projectile crashes through a window, damages can occur to the building structure and/or belongings stored inside. 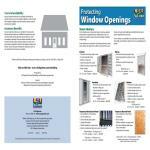 Because of their vulnerabilities, it is important to protect windows and window openings. Installing storm shutters or impact-resistant windows are two methods to use for protecting window openings. Colonial shutters – these shutters have a permanent mounting, are ready to close, are functional & decorative, have a medium-to-high cost, are closed manually from the outside, are difficult to access on upper levels and block sunlight. Accordian shutters – have a permanent mounting, are ready to close, have a medium-to-high cost, are closed manually from the outside, are difficult to access on upper levels and block sunlight. Bahama shutters – have a permanent mounting, are ready to close, are functional & decorative, provide shade in direct sun, have a medium-to-high cost, are closed manually from outside, are difficult to access on upper levels and block sunlight. Roll-up shutters -- have a permanent mounting, are ready to close, are closed manually from outside or motor driven. Manually operated roll-up shutters are difficult to access from lower levels. These shutters are more expensive than the previous. Two types of temporary shutters that can be used are manufactured panels and plywood panels. Manufactured panels are easy to install on lower levels of a house, have a low-to-medium cost, and must be installed and, then, taken down every time they are needed. Some materials these manufactured panels are made from, such as plastics, allow sunlight illumination. Similar to manufactured panels, plywood panels are easy to install on lower levels of a house and must be installed and, then, taken down every time they are needed. These panels are inexpensive and block sunlight. Large panels can be heavy. Storm shutters are required for all Louisiana homes in wind zones 120 mph and above and/or within 1 mile of the coast. Check with your local building code office for the storm shutter regulations in your area. Carefully follow manufacturer’s instructions and guidelines. Be sure to attach shutters to structurally adequate framing members. Avoid attaching shutters to the window frame or brick veneer face. During high wind episodes, shutters attached to window frames can create stress on the frames and cause the frames to fail. Attachment of the shutter directly to the wall framing is a more reliable method of attachment. Always use hardware not prone to corrosion when installing shutters. Measure each opening -- Measure each opening, horizontally from inside to inside of the exterior trim and vertically from the sill to the bottom of the top trim. Add 8 inches to the width and 8 inches to the height measurements so that the panel overlaps the wall framing around the opening. Cut to Fit -- You will need a hand or circular saw, drill and drill bits, hammer and wrench. Be sure to purchase 5/8" or greater exterior grade (CDX) plywood. Plywood sheets are generally 4'x8', so your local building supply retailer can help you determine how many sheets to buy using the information about the number of openings you need to cover. More than one sheet may be necessary if you have any single opening larger than one 4'x8' sheet of plywood. A range of types of fasteners can be used to attach a plywood shutter, including double-headed nails, wood screws, bolts, wood or masonry anchors, nuts and large washers. If the shortest dimension of the window or door is 4 feet or less, space fasteners at 6 inches on center. If the shortest dimension exceeds 4 feet, space fasteners at 3 inches on center. Mount plywood and fasten into place. Mount the plywood with 2 fasteners first (one on each corner) then install the remainder of the fasteners -- this will reduce the strain on your helper and facilitate set-up. Remember, even the best designed shutter will fail in strong winds if not installed properly. So, try to get as tight a fit as possible on the plywood. You don't want to allow wind to get under the shutter. Another way to protect your home from damage in windstorms is by installing impact-resistant windows. Although these windows look no different than standard windows, they offer significantly more protection from wind-borne debris. In fact, these systems are capable of resisting impacts from large objects. For this reason, temporary shutters do not need to be installed before a storm strikes. In general, the frame and glazing work together to protect your home from both the elements and the significant internal pressure changes which lead to structural damage. While large wind-borne debris may crack the impact-resistant glass during the course of the storm, the window is designed to retain its integrity and not break apart. Should either the frame or glass be damaged, it can be repaired at your convenience after the storm has passed. Impact-resistant windows are comprised of impact-resistant glass surrounded by a heavy duty frame securely fastened to the interior window header and frame. The construction and anchoring of these windows keep high winds and debris from damaging a home’s outer envelope. Before you buy impact-resistant windows, be sure a Miami-Dade County impact test has been done on them. Miami-Dade County, Florida has the most stringent hurricane-related building codes and this test is considered to set the highest standards for impact-resistant windows. In Florida, residents building in hurricane zones must install impact-resistant windows or a permanent shutter system. The impact tests do not guarantee the windows will survive a hurricane, but they do test specific conditions that they should survive. If the structural shell of a house or business can be maintained, the structure is more likely to be saved. Once wind enters a building, it becomes much more likely that the structure will be significantly damaged. The Miami-Dade Building Code requires that every exterior opening - residential or commercial - be provided with protection against wind-borne debris caused by hurricanes. Such protection could either be shutters or impact-resistant windows. There are two types of impact-resistant products: large-missile resistant and small-missile resistant. Large-missile resistant -- A product is tested as large-missile resistant after it has been exposed to various impacts with a piece of lumber weighing approximately 9 pounds, measuring 2" x 4" x 6' (no more than 8') in size, traveling at a speed of 50 feet per second (34 mph). Then the product must pass positive and negative wind loads for 9,000 cycles, with impact creating no hole larger than 1/16 x 5" in the interlayer of the glass. Small-missile resistant -- A product is declared small-missile resistant after it has been exposed to various impacts with 10 ball bearings traveling at a speed of 80ft. per second (50 mph). The product is then subjected to wind loads for 9,000 cycles. To find out if a window or other building product is certified for use in Miami-Dade County, go to the Miami-Dade County Building Code Compliance Office Web site. Tape. Experts say tape should never be used to protect windows. Hurricanes produce devastating forces requiring more than tape to protect against extreme pressures and flying debris. Window/safety film. This allows some modest protection by holding glass together, preventing flying glass hazards, but does nothing to keep the glass attached to the window frame. Experts agree this is not adequate protection for homes in hurricane-prone communities. Audio clip: What is the best way to protect my windows during a hurricane?